Click here for the list of 53 Chakra stones and Chakra crystals for complete associations and correspondences. Color, crystals and Chakra stones are an easy way to open and balance the Chakras. Each of our Chakras has it’s own unique healing color, which are also the same colors that appear in a rainbow. Furthermore, these pure, spectral colors can be used to energetically influence the senses, balancing the body, mind and soul. Colors, like each of the highly effective Chakra healing sounds, also have frequencies, measured in terahertz, and wavelengths measured in nanometers. A very powerful Chakra meditation is to “breath in” color. 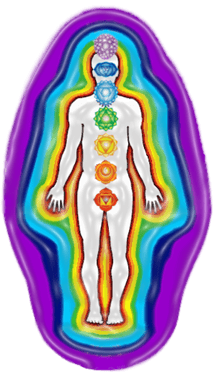 With each breath, imagine breathing in a particular Chakra color, and direct this charged “Prana” (the Life giving Energy of the Universe) to that Chakra, healing it with Life energy. 380–450 nm Click here for information on Chakra Stones. Each Chakra also has Chakra healing crystals and balancing chakra stones. These Chakra stones are in Chakra co-ordinated colors, which can be used in Chakra gemstone and crystal healing. This results in profound effects physically, emotionally and spiritually. Unfortunately, if our Chakras are blocked or drained, then our body, spirit and mind can not function properly. Clearing and balancing our Chakras with Chakra colors, gemstones, crystals and Chakra sounds, can easily and effectively, bring us back to a vibrant and healthy energetic balance. The intrinsic properties of chakra stones and crystals can activate and balance the energy of the chakras. Chakra stones and crystals can have natural healing frequencies, that resonate with the vibrational frequencies of each chakra. 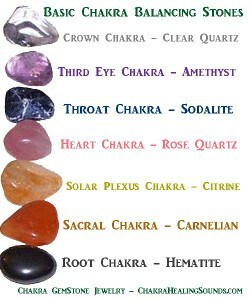 As a result, a Chakra stone or crystal can activate the movement and balancing of the natural, vital energy within you. To activate your chakra stones and crystals, use your intention and imagination to visualize energy. Magnify and channel this energy through your Chakra crystal or stone. As a result, this will activate the healing and balancing properties of your stones or crystals. In turn, this will activate the healing of the chakra you wish to balance. A chakra can have several crystals and stones; use your intuition to choose the healing crystals and stones right for you. When choosing gemstones and crystals in person, look for the ones that attract you with their glow. Finally, feel the energy with your hands, and if you feel a warm or tingling sensation, that’s the stone for you. Once you have chosen your chakra stone, place it over, or near, it’s associated chakra. You can lay down, and place the Chakra stone or crystal over the Chakra. Alternately, you may hold it in your hand, or wear it as jewelry, or you can keep your Chakra stone in your pocket. Focus on activating your Chakra stones and crystals, by meditating on your intention. In addition, simply relax in the knowing that your chakra stone is there to to balance and harmonize the frequencies of your chakras. Don’t forget to energetically cleanse your Chakra healing crystals and stones, before and after you use them. You can leave them under water, or bury them under the earth. Alternately, you may leave them in the sun for a day, or under the moon light for a night. Finally, you can smudge them with sage. The THROAT CHAKRA’S color is aqua or turquoise, secondary colors are various shades of lighter blues. Chakra stones like turquoise or blue lace agate balance this chakra. The BROW CHAKRA’S color is indigo or shades of dark blue. Chakra stones like lapis lazuli or sodalite compliment this area. amethyst or clear quartz are perfect. Click here for the list of 53 Chakra crystals and stones for complete associations and correspondences. Why “Clear” Chakra Stones & Crystals? Chakra crystals are a tool, and can be a storage battery for thought energy. “Clearing” has to do with the energy of the stone or crystal. Chakra crystals can be “programmed” with our thought energy, and therfore act on our subtle chakra energy fields. In addition, they also to help to create situations in our lives, that will lead us in directions that allow positive growth and healing. Clearing a Chakra stone or crystal is a simple task, and it’s a way to insure that there are no left over negative energies, from the person who owned it before you. It’s a way to personalize your Chakra crystal or stone, and create a new energy bond between you. Ultimately, there are many ways to do this. This is a simple and effective way; first, make sure you will not be disturbed. Next, hold your new crystal or Chakra stone under running water. As the water pours over it, close your eyes and imagine all the negative energies are washed away down the drain, and out to the vast ocean. Finally, you can also leave your Chakra stones and crystals in the warm sun, and allow the power of it’s light to purify it with “fire”. To program your new Chakra stones or crystals, simply hold it in your hand, close your eyes, and in your imagination, create an image of what you want your crystal or gemstone to do for you. For instance, help you to be a more patient and loving person, or more responsible. Keep your Chakra crystal or stone close to your skin, and when you can not wear it, store it in a special box or bag, which has also been purified and blessed. Finally, fill your crystal companions with love, and you will receive it back threefold! Agate: Balances ying-yang energy, and stabilizes the aura. In addition, imparts strength and courageand opens one to innate creative talents. Purifies the body, mind, and spirit. Also, balances the energy of the body, and allows for an even flow of energy. Above all, provides a positive, soothing energy, which spiritualizes the intellect. Has a strong, calming energy, encouraging spirituality and contentment. In other words, it is excellent for meditation and enhances psychic ability. In addition, it is stone of stability, strength, and peace. Fosters independence, leadership, creativity. In addition, balances male and female energies, and aligns intellectual, physical, emotional, and etheric bodies. A gemstone to foster courage, intellect, and protection. Also, it assists in spiritual awareness and actualization. Awakens psychic ability, insight, and intuition. In addition it opens the third eye. In conclusion, it is an excellent chakra stone for clearing the mind for meditation. A gemstone to balance your energy, foster harmony and Universal love. Bloodstone imparts strength, courage, and the self confidence needed to succeed in business and legal affairs. In addition, it attracts wealth, sexual potency, and insures victory. This stone is an energy amplifier, excellent for clearing and cleansing your energy. Carnelian is a healing stone, that counteracts feelings of apathy, fear and rage. Also, it fosters peace within and without, imparts self confidence. Finally, it inspires verbal and written communication. Excellent stone for dream recall and astral travel. This gemstone fosters strength and balance. Also, it promotes harmony, and attunement to the Earth, as well as purifies one’s environment. This stone dissipates negative energy, and fosters warmth, joy, and optimism. This precious crystal fosters purity, perfection, abundance, and inspiration. The crystal of loyalty, sensitivity, harmony, and tranquility. Also, it assists in memory retention and mental clarity. A gemstone of stability, order, discernment, and concentration. Also, it helps one to understand and maintain ideals. Fosters loyalty, emotional sensitivity, harmony, and tranquility. In addition, it assists in memory retention and mental clarity. Also facilitates balance, abundance and prosperity. A crystal of commitment, devotion, love, stability and order. In addition, garnet facilitates the even flow of energy. A stone excellent for the mind. It is also and grounding. A stone of harmony, peace, fidelity, confidence. Also a great dream stone. A stone of protection, awareness, insight, and grounding. Facilitates communication, love and peace. Also protects and dissolves negativity. Excellent for meditation. This chakra stone never needs cleaning or clearing, and it aligns all the chakras. Fosters tranquility, communication, and psychic awareness. In addition, it is excellent for meditation and dream recall. This gemstone represents the light of the Universe, and has an extra-terrestrial energy. Also, it facilitates intuition and spiritual illumination. The stone of knowledge, wisdom, perfection, protection, and creative expression. Embodies honesty, stability, hope, and acceptance. Also, it assists in change and transition, and facilitates astral travel. Lodestones are natural magnets, and for many centuries, have been used to charge spell items, primarily to attract good luck, healing, money, and love. Facilitates transformation and spiritual development, as well as clearing the way to attain goals. A stone of clarity and eternity, facilitating extra-terrestrial and interdimensional access. A gemstone of lunar female energy. Also, it facilitates emotional and intuitive clarity, rhythms, cycles, and destiny. Dispels negativity, and used for grounding, healing, and protection. Also, it helps to clearly see one’s flaws, and make the changes necessary. A stone of centering, self-control, and intuitive guidance. Also, it can assist in the grieving process. A beautiful gemstone of creativity, inspiration, and imagination. A healing and protective crystal, that allows you to understand the changes in your life, and regulates life cycles. A fossil stone for grounding, and provides strength. Also, it is a stone of transformation. Shields you from negative energy, a good stone of protection. In addition, it enhances the intellect and memory. It is a symbol of the sun. The Universal crystal, clarity of consciousness. The quartz crystal can be ‘programmed’ to help clear away negative energy from the aura and re-align the chakra energy centers of the body. Fosters love energy, and an excellent stone for balance in all areas. This crystal empowers and attracts the energies of love, happiness and peace. Also, it balances the heart chakra, and encourages healing on all levels. Love, nurturing, spirituality, wealth, and protection. Facilitates trance states and a connection to the divine. Also good for facilitating communication with angels and Divine Beings. Finally, it deepens an understanding of the esoteric and unseen. This crystal intensifies energy, and stimulates the brain, fostering inspiration and clairvoyance. A crystal of beauty and prosperity. A “Crypto Crystalline Quartz”, it is said to contain the loftiest vibration of all stones on Earth. Shiva Lingam emanates a vibration that will purify your temple or home. The stone represents both the male energy of knowledge & the female energy of wisdom. This crystal dissolves negativity, and fosters grounding, and balancing. In addition, it is excellent for meditation. The gemstone of logic, efficiency, and truthfulness. It enhances group communication. A stone of spiritual love, perfection, inspiration, and confidence. Also, it alleviates negative and destructive emotions. An earthy, grounding stone, it represents the sun and earth. Also, it facilitates optimism, insight, and personal power. A gemstone for success, true love, individuality, creativity, and joy. Fosters inspiration, understanding, self-confidence, and emotional balancing. A crystal of strength and balance, it combines attributes of both tourmaline and quartz. A stone of spiritual attunement, strength, and grounding. In addition, it is excellent for astral travel. A crystal representing virtue, unification, continuity, and purity.